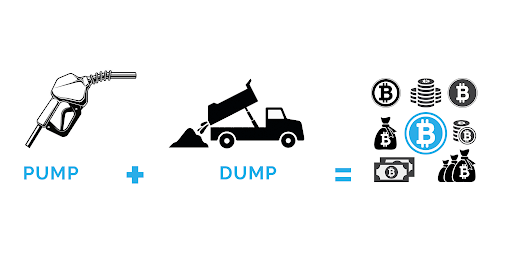 Crypto Pump and dump is a form of fraud by an investor or group of investors that involves increasing the price of a cryptocurrency through false statements and fake announcements, so as to sell these cryptocurrencies at a higher price. This is most common with small cap cryptocurrencies. Fraudsters (aka investors or a group of investors) organize campaigns via social media channels for eg. Telegram, Slack, Discord groups. They broadcast fake information in order to reach large numbers of potential investors. The sudden hype in demand, price, trading volume convinces more people to buy the cryptos. In the meantime, if the fraudsters sell their holdings and the demand and price crash in the case, the holders are left with nothing less than what they have paid for. Suppose a Discord group is composed of more than 30,000 individuals. Half of the group puts $550 in the coin, but here, in the pump and dump strategy, fraudsters promotes it claiming that the coin sums $7.5 million. Individuals who are seeking fast profits come together online, buy it through Binance and Bittrex in exchange for their crypto coins. Soon after they buy, they sell or try to sell them at an increased price rate. Those who buy and sell in right time, potentially gain a huge share of profit. Those who are a newbie to the group and have zero ideas about the pump and dump strategy get scammed. This game happens almost every single day. Fraudsters attract other people to join a group on semi-anonymous messaging services like Telegram, Slack, Discord. They charge a fee ranging from $10-$1000 to participate in a pump and dump. If you are acting on what they say, they offer a profit of 100% to 200%. Fraudsters decide which altcoin is ready for a pump and dump crypto. They normally go for unknown or small-cap cryptocurrencies. The best thing about these small-cap cryptos is that these altcoins are easy to make, low price and lowest trade volume. The fraudsters buy such small-cap coins for the lowest price and when it’s time for pumping, they make the announcement in the group. All the crypto pump and dump are done on exchange via Binance and Bittrex. The fraudsters inform the group which coin they should buy by setting a target price. Eg. the fraudster announces in the group to buy Q coin under a target price. In return for this purchase, the fraudsters target a portion of member's investment. It very well may be BTC, ETH, BCH whatever investment they hold. The members rush to buy the Q coin who seek to get instant and easy wealth. A stop-loss is also given in case anything goes wrong. Soon the members start to buy Q coin the price straights up. In no less than a minute, the members are instructed to sell the Q coin as quick as possible in order to make a profit. Meanwhile, the fraudsters who already bought the Q coins, in the beginning, starts to sell them to the group members who are still into buying it. This causes in dropping the price. As soon as the group members notice the price drop, members try to lower their sell orders to earn more profit. Before they could make an attempt to sell the Q coins, the market collapses. Anybody who invests immediately and dumped right at the peak could potentially earn the huge return of investments. But for the rest, it would feel like thrown into a chasm of no rescue. Towards the completion of the Crypto Pump and Dump, the Fraudsters expands their balance by 100%-200%, some group members make it 10%-20%, however, the vast majority of them lose their investment. Two kinds of approaches are generally seen in this dilemma. The first approach will be like the person who suffered loss will think, just because he kept the coin way too long without selling, he lost the bullseye point and he will try again. The other approach is from the gambling maniacs who have entered this field just to make a sharpish profit with minimum effort. Reality is that they will keep losing it until they realize it is too late and on the other side the fraudster is making a huge profit just by manipulating these people’s naive nature. 1. By paying high fees. 2. By assigning ranks according to their participation - Your ranks solely depends on the number of people that you have invited. The more you invite, the more you step up to the higher ranking levels. these will reward you with faster signals for the pumps. Ways apart you are always the beneficiary, you will receive pumping signals way before the layman group. In the fast-paced world of the pump and dump crypto, each and every second count, actually seconds determine your future here, that is if you don't buy the altcoin within the first few seconds of the pump, you will end up broke. The speculation among the groups is that the culprits behind these are bots which are allegedly used by members to buy and sell a large number of coins instantly. The light of the matter is that bots are not the culprits here. The real sinner behind the curtain is the fraudsters who have arranged the scam so well so that they are the only one getting profit out of it. In such an unregulated cryptocurrency market, fraudsters are making a huge amount of money at the expenses of new investors. Do not think that you can make a huge rate of investment and quick profit. Unless you have an idea on what you are doing, or you have a huge amount of money that you are comfortable losing, stay out of such groups. Do your own research about any investment. Remember we are surrounded by scams. This is Crypto pump and dumps all about. It is pretty cool to stay hungry, but not foolish.